Since webmasters have free reign when it comes to specifying font sizes and styles on their websites, you sometimes may stumble upon sites where the font is too small or too large, not really readable because of its style, or because of its color and the page's background color. While you can take care of most of this manually whenever you encounter it, for instance by zooming in or out using the Ctrl+ or Ctrl- shortcuts that should work in all modern web browsers, you may want a permanent solution for select pages that you visit over and over again. 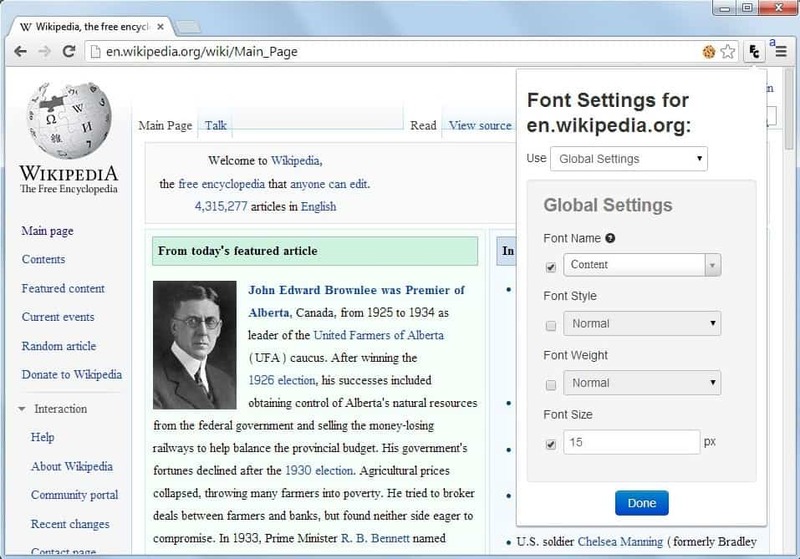 It is possible to change the font size and style in browsers such as Google Chrome, Firefox or Internet Explorer, but that will affect the display on all websites that you open in the web browser. A better solution is a browser extension that lets you change font sizes and styles for each website individually. The Font Changer extension for Google Chrome does exactly that. While you can use it to change global font settings in the browser, for instance by increasing the size of the font in the browser or with a switch to a different font style, its real strength comes in form of per-domain customizations. The Chrome extension adds an icon to the browser's address bar. A click opens the preferences menu on the current page. The use menu at the top defines whether you are changing fonts for all websites and pages that you open in the browser, only for the domain you are on, or if you want the particular domain to use Chrome's standard font settings instead. The latter option is useful if you have modified the global font settings with the help of the extension, but do not want that individual sites make use of them. Change the font. The list displays all available fonts, hundreds of them and a preview as well to help you pick the right font from the list. Font style to change from normal to italic or oblique. Font weight to change from normal to bold, bolder or lighter. Font size to increase or decrease the size of fonts. The extension is really easy to use, and will assist you in changing font related settings on all websites, or only select websites in the Chrome web browser. If you ever wanted to have larger text on Wikipedia or Gmail, a different font type on Reddit or Yahoo, then this is your option to make that happen.